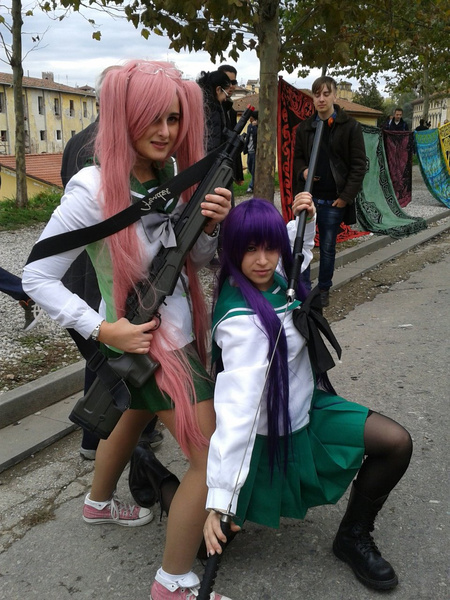 Highschool of the Dead fans, if you have been looking for a great, authentic costume for your Cosplay events, conventions or parties, we think this one would make a great choice. Inspired by the series character, it has a cute sailor-style shirt with traditional sailor-style collar in green, long sleeves and a pretty green bow accent at the neck. The skirt is green as well and is made in a lovely pleated style. Alternately, you could pair the skirt with items from your every day wardrobe and create a whole different look. Either way, this would make a great addition to anyone's closet – Cosplay or otherwise.Top, skirt and bowknot are included. la sua foto e' bellissima!! Siamo lieti di averla soddisfatta, ci auguriamo che tu possa nuovamente venire a visitarci. Perfect fit, pretty fast shipping. Great quality! I recommend ironing the pleated skirt before wearing but all and all a great costume for the price. 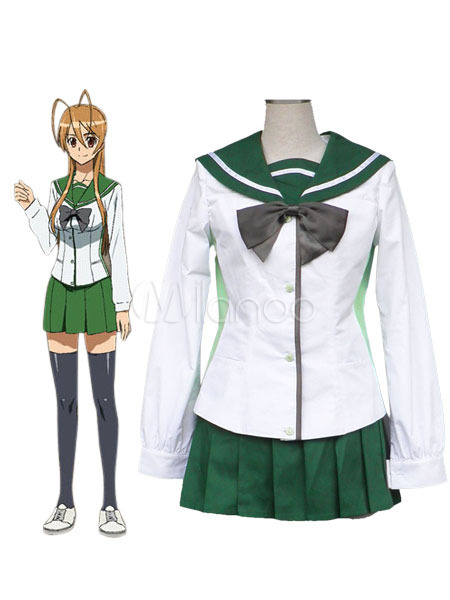 Would highly recommend this outfit for any High School of the dead cosplayers looking for a good uniform at a great price. The quality is niquel, I ordered it for a convention, I even stained it with fake blood and everything is gone. It is soft and comfortable but the blouse was too wide at the waist because I had it in L because of my chest, the skirt was too wide but for an L it was respected. I really loved it. 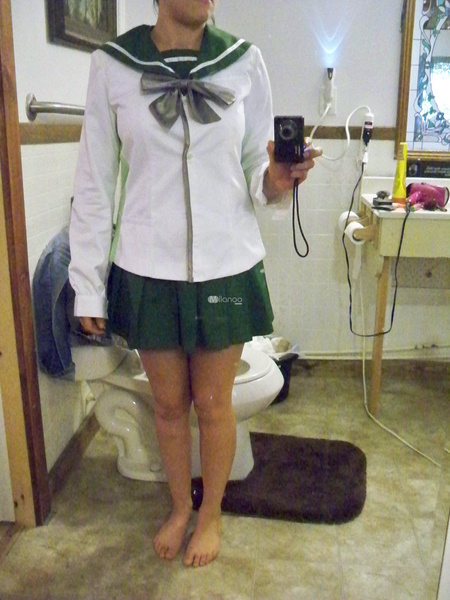 Love this school uniform cosplay costume.The detail of the costume is amazing. I could not of hoped for a better costume.The delivery is fast and the package is really nice.Thank you Milanoo. when i got my outfit i was pleased with it. came right before my anime convention. the only thing i didn't like was i had to bring it to get it custom tailored, to make it smaller. I also paid for my costume to be tailored thru here too. but i don't know why it was still big. when i gave my measurements. i do like this outfit tho. thanks milanoo!! I just got my cosplay, tried it on, and it's WONDERFUL! 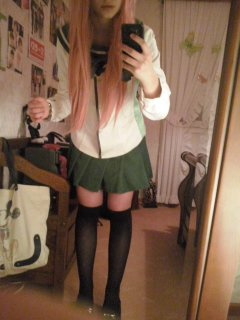 The skirt however, could have been just a little bit smaller around the waist however that is an easy fix. All in all; if you wanted to cosplay from H.O.T.D. I recommend this cosplay! I just got mine today, it's so much better than I ever expected! Not like those crapy costumes from Halloween stores you pay twice as much for! It's made with real cotton fabric, the shirt and skirt do come separately like and actual outfit and the bow tie is silky! I am amazed by the quality and the effort on Milanos part, for putting everything in zip bags and putting the shipping info inside a card! I will most defiantly shop here again and again! The quality is so much higher than the picture shows,best thing I have ever gotten for the money.I HIGHLY recomend this costume. Does this run big or small? We've provided various sizes in the size chart for you to follow up your measurement ,would you please kindly refer to it then choose your well fitting one .Thanks!